The Sterling Style Academy offers our eLearning Short Courses to earn a certificate as a Fashion and Style Consultant. The Sterling Style Academy 5 Step Successful Style eCertification Program enables you to consult your clients using our revolutionary, industry tested + proven, eLearning Short Courses in order to execute excellent personal style, wardrobe, and personal shopping consultations and look books. Our eCertification Program is the #1 choice for men and women worldwide who would like to become skilled in performing compelling style consultations in their city. Diversify your skill set, supplement your income, get instantly certified, and get mentored by the best for you to become recognized as the best. Earn your training investment back in as easy as working with one or two clients. We recommend studying the program in the order they appear above. Your certification program begins upon purchasing the electronic version of the following program as a Certified Fashion and Style Consultant which includes the purchase all 5 eShort Courses + 45 minutes of one-on-one Skype mentoring and training for US$997. When we receive an email notification of your purchase, we will email you access to download the program. Please allow up to 24 hours to receive access to the program as well as receive your certificate due to time zone differences. You may later choose to upgrade your certificate to become a certified Personal Stylist through our fully comprehensive Instructor Led Online Personal Stylist Training Program. Best of all, all of our materials can be easily translated into your language of choice when you download our training manuals. 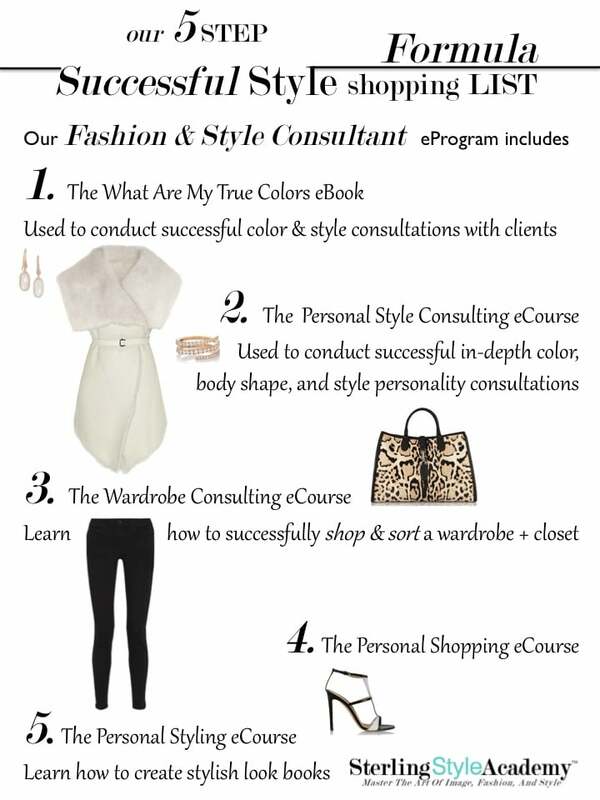 Save approximately $400 when you purchase the entire Fashion & Style Consultant certification program for US$997 rather than purchasing each Short eCourse and mentoring individually. AVAILABLE IN SPANISH: The What Are My True Colors - Color Analysis Booklet, the Personal Style Consultation workbook as well as the client consultation forms included in this eCourse, and Personal Shopping are also available in Spanish. The templates for Personal Styling can be used in Spanish as well. All instructional videos are in English. If interested in the Spanish version of these eShort Courses, please email us at info@sterlingstyleacademy.com after placing your order. ADDITIONAL MENTORING: We recommend scheduling additional one-on-one virtual mentoring and training as needed to ensure your career success. During this 1.5 hour intensive mentoring consultation, we will help you mitigate potential challenges that may arise by providing you with modern real world industry insight, career direction and support as well as answer all your other questions about setting up your business and how to get started. Utilize our expertise and allow us to be your business coach. All Sterling Style Academy graduates and prospective trainees are invited to schedule business mentoring virtual training sessions to help you gain that competitive edge. Upon receipt of your registration for mentoring, we will email you to schedule a mutually convenient time for this consultation. All Sterling Style Academy training programs, eCourses, and training products are non-refundable and are billed through Global Image Group, Inc. You will receive an email within 24 hours of purchasing the eCertification Program with access to the training program along with your certificate.